Animals of the bear family (including seven existing species of bears and one species of giant panda) usually have very low cub to mother weight ratio. This ratio of giant pandas is at the lowest 1:1,000 to 1:1,500. The newborn's weight only about 150g (0.33 pounds), which is approximately one thousandth of their mothers' weight. One month after birth, they will weigh 2kg (4.4 pounds), then reach 5-6kg two months later. According to existing records, the smallest newborn cub was only 51g (0.11 pound) and the biggest one weighed 247g (0.54 pound). 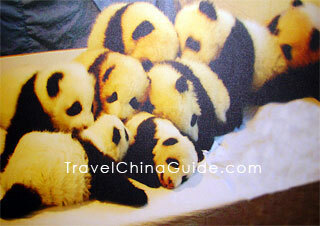 Panda cubs are very small and fragile. To some extent, they all are premature. Newborn cubs are pink and translucent-skinned with tenuous and sparse white hairs. There is no trace of the black markings and eye patches now. Their eyes are closed tightly without eyesight. The ear parts are two mungbean-sized prominences. Their tails make about one third of their length, while when they grew up, their 10-20cm (about 3.9-7.9 inches) tails are comparatively short. However, such an immature creature can cry loudly to draw mom's attention. It is true that these tiny fellows do need vibrant cries to let their mothers find them easily. As they grow bigger, they vocalize less. Two months later, baby and puppy like cries cease to be replaced by squealing. About one week after birth, black fur begins to grow on ears, eye patches and shoulders. Black hairs appear on legs several days later. Hairs on ears become more obvious. Black eye patches extend to become round. After half a month, there is black around their muzzles. Nearly 20 days after birth, their black furs become thicker and chest fur turns black too. Eye patches continue to enlarge, just like the shape of adult pandas. At this period, they have black fur on neck and paws. Around the 25th day, black fur is extended to the entire neck and chest. Eye patches are bigger. New white fur grows. Their eyes open partially 30-45 days after birth and open fully one or two weeks later. On the 50th day, the midline on the chest and belly fur turns brown, and a cluster of black fur appears on the tail tip. The newborn cubs are weak and can not stand. For their first two months, they hardly move, except being fed and sleeping. At four months old, they have eyesight and can move a little with poor motor coordination. They can run a little, tumbling and crawling up to their mother's back. Half a month later, they like to be active, mimicing their mother's movements of eating bamboo, although they can not eat yet. When the cubs are half a year old, they can eat some bamboo and gain weight quickly. 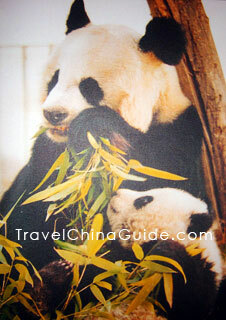 Giant pandas will leave their mother and live alone when they are 1.5 to 2 years old. 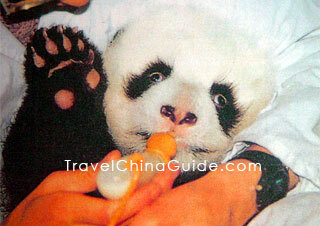 Related Information: Newborn pandas are premature! 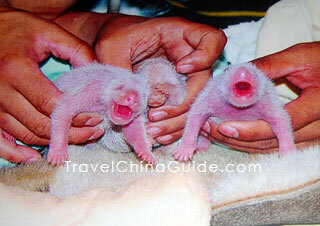 Infant pandas are immature when they are born, equivalent to 4-6 months of human embryos. They do not have cerebral sulcus in the brain, white corpuscles in the blood and a sound renal function. It is hard to determine the gender of the cub. Their eyes and ears are not mature either - only small prominences. The establishment of their immune defense entirely relies on breast feeding for the first few days. When does a giant panda stop growing? 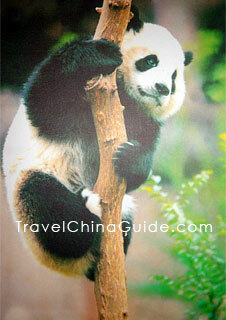 Generally, the adult life of a giant panda is from 5 to 18 years old and after that it will get into its old age. The pregnancy is usually around 130 days. When they are 1.5 years old, they have grown up enough to leave their mothers. They have to live alone. how many cubs do pandas have ? One panda usually have one baby each time, sometimes two cubs.